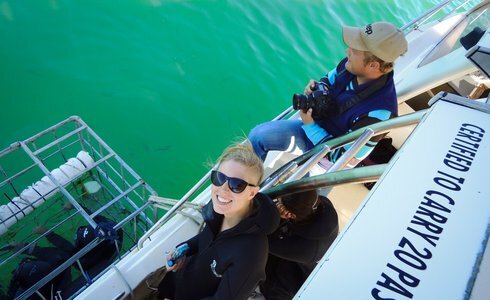 Shark Diving Trips departing Cape Town to Kleinbaai harbour in Gansbaai one of best great white shark cage diving destinations. Experience the ultimate thrill with a Great White Shark Cage Diving Tour, coming face-to-face with the sea's most notorious predator. Meet nature's most feared predators and experience one of the most exhilarating days of your life, leaving your trip to Cape Town forever imprinted in your memory. The Great White shark cage diving tour starts early morning in Cape Town. 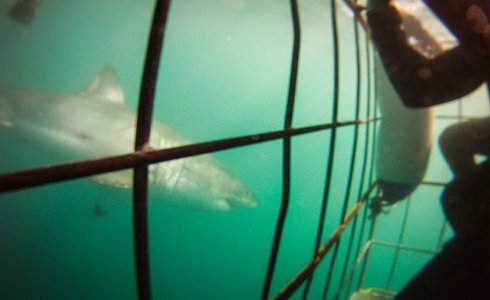 You'll be transferred to the scenic Kleinbaai harbour in Gaansbaai - renowned as one of the best Great White shark cage diving destinations in the world. Upon arrival at the crew house, breakfast will be served followed by a briefing of the day'as activities. The shark cage diving expedition takes place in the ‘White Shark' which is a luxurious and powerful 30ft (10m) Dive Cat deep-sea cabin cruiser fitted with the latest navigation aids, systems and two outboard motors - ensuring a safe, enjoyable and speedy ride out to the islands. The boat leaves the harbour taking approximately 15 to 20 minutes to reach Dyer Island, then dropping anchor. Dyer Island is home to a permanent colony of 40000 Cape Fur Seals, the primary source of nutrition for the Great White and thus the ideal area for great shark viewings. A picnic lunch will be served on board, and for passengers who succumb to sea-sickness, there are areas to rest and recover from the rigors of sea-travel. Additional information on the shark dive: you do not need any diving certification to do the cage dive. We anchor for four to five hours. 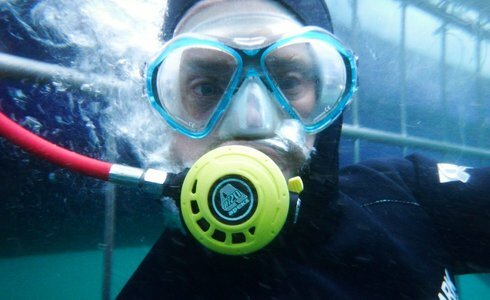 Diving time is unlimited, and for the first dive you stay in the cage for about 20 - 40 minutes. We use a 5 person cage and so there is plenty of time to cage dive. (We can guarantee you at least 2-3 dives, depending on the shark activity for the day). The boat carries 20 passengers, so in order for us to enhance your overall experience, early reservations are absolutely essential. Please note: Sightings of the Great White shark cannot be guaranteed. Shark viewing is best during the winter months (May - October) but the likelihood of seeing the sharks in the summer months (Nov - April) is still considered good. In the case of a delay due to weather conditions you will be credited in full; however it is advised that you book this tour ahead of your trip.